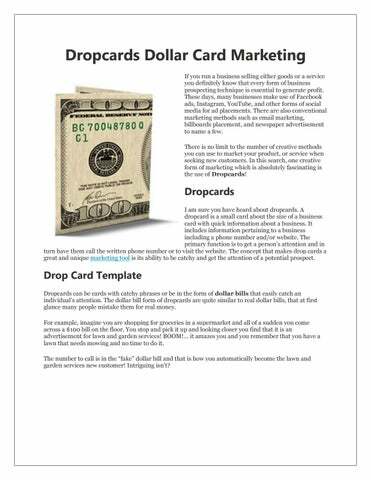 Dropcards Dollar Card Marketing If you run a business selling either goods or a service you definitely know that every form of business prospecting technique is essential to generate profit. These days, many businesses make use of Facebook ads, Instagram, YouTube, and other forms of social media for ad placements. There are also conventional marketing methods such as email marketing, billboards placement, and newspaper advertisement to name a few. There is no limit to the number of creative methods you can use to market your product, or service when seeking new customers. In this search, one creative form of marketing which is absolutely fascinating is the use of Dropcards! Dropcards I am sure you have heard about dropcards. A dropcard is a small card about the size of a business card with quick information about a business. It includes information pertaining to a business including a phone number and/or website. The primary function is to get a person’s attention and in turn have them call the written phone number or to visit the website. The concept that makes drop cards a great and unique marketing tool is its ability to be catchy and get the attention of a potential prospect. Drop Card Template Dropcards can be cards with catchy phrases or be in the form of dollar bills that easily catch an individual’s attention. The dollar bill form of dropcards are quite similar to real dollar bills, that at first glance many people mistake them for real money. For example, imagine you are shopping for groceries in a supermarket and all of a sudden you come across a $100 bill on the floor. You stop and pick it up and looking closer you find that it is an advertisement for lawn and garden services! BOOM!… it amazes you and you remember that you have a lawn that needs mowing and no time to do it. The number to call is in the “fake” dollar bill and that is how you automatically become the lawn and garden services new customer! Intriguing isn’t? Drop Card Marketing If you have never come across this kind of marketing strategy before, it will definitely leave you perplexed. The novelty of the advertisement/marketing method will stay in your memory for a long time. The dropcard is unique and interesting and could easily be passed on or shown to family, friends, and acquaintances thereby creating more exposure for your business. One super amazing thing about this is that if someone picks up this dropcard thinking it is a real dollar bill and s/he is not interested in the ad, the person will more than likely toss it back on the ground where it will remain until another person picks it up. This will certainly not happen with a conventional business card. Drop cards then become a very effective and relatively cheap means of creating awareness for your business. 100 Dollar Bill Folded Compared to the huge cost of running ad campaigns on television and on billboards. Dropcards are a very cheap means of running advertisements. 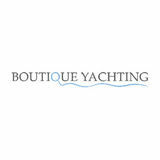 They have a larger reach for a lower percentage of cost. Itâ&#x20AC;&#x2122;s no surprise that many businesses are embracing this form of marketing. This type of marketing is both effective and cheap. Even many musicians around the world have been known to give out dropcards at their concerts.